The Story of Mistletoe: A Christmas Parasite. It’s that time of year again, full of food and cheer and deep-rooted traditions. A kiss under the mistletoe will result in marriage, fertility, true love…and yet this romantic Christmas symbol is in fact – you guessed it – a parasite. Viscum album is the name of the European mistletoe that parasitizes host trees, particularly the Oak tree, using the host water and nutrients to aid its own growth. However the leaves do perform photosynthesis and so it is considered a hemi-parasite, cultivating some of its own energy. The Druids were the first to lionise the mistletoe, revering it for its alleged healing properties; the ever-green colour of the plant led them to associate it with fertility and vitality. In fact its success as a parasite led them to believe that, thriving as it did on otherwise barren and bare tree limbs, it had some sacred property, compounding its position as a potent symbol of fertility. In the 18th and 19th centuries it made its way into our homes as Christmas decoration, its kissing connotations referenced in Dicken’s The Pickwick Papers in 1836. This tradition may have come from a Norse myth involving Frigga, the goddess of Love and Marriage, whose son Baldur was killed by a spear of mistletoe. Some versions say that the tears she shed over her son changed the mistletoe’s red berries to white and brought him back to life. Frigga then reversed the bad reputation of the mistletoe by kissing everyone who walked beneath it in gratitude. Others simply suggest that the Gods kissed under the mistletoe in remembrance. This story also alludes to the dangers of mistletoe, the berries of which can be poisonous! 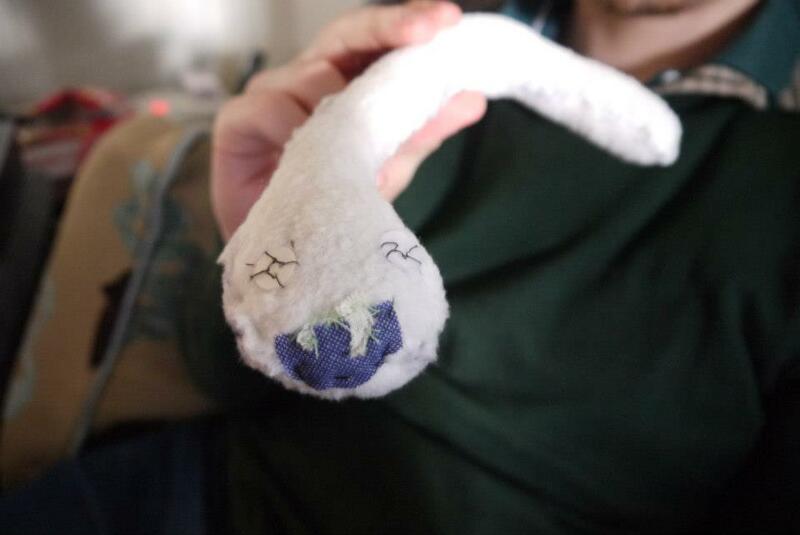 On the subject of Christmas parasites, my little sister made me one for Christmas. Meet Ancylostoma duodenale, the human Hookworm parasite. This charismatic-looking beastie is a parasitic nematode with a mammalian definitive host. It has a free-living stage where it dwells in the soil; it will burrow through the skin between the toes of anyone who walks barefoot, and from thence enter into the bloodstream. Migrating to the lungs, the larvae are then coughed up and swallowed into the small intestine where they develop into adults. Yummy! And this post wouldn’t be complete without a gruesome video!